Following on from our student attendance integration we have also integrated the student timetable. The data comes from an XML feed and is rendered in PHP within a Moodle page. 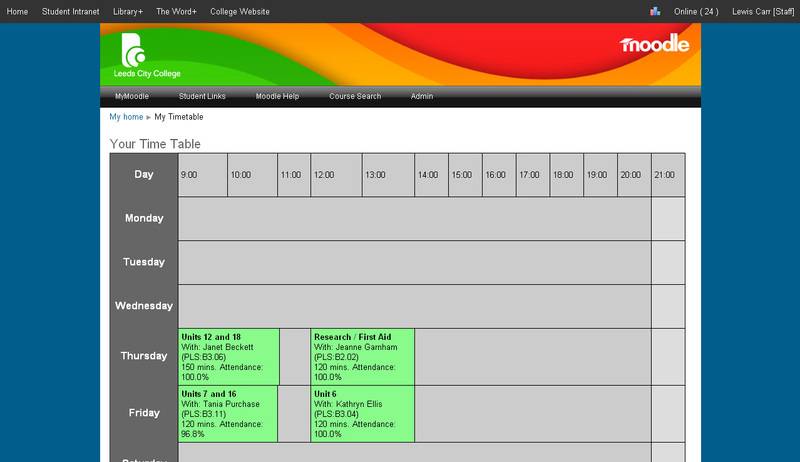 The timetable is dynamic and always up-to-date and students access it from the link in the MyMoodle page from the MyProfile block or direct form the drop-down menu within the theme itself. 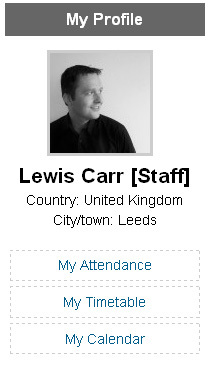 In order to further enhance the value of Moodle at Leeds City College we have integrated the student attendance record into a Moodle page. Students can see see their attendance register from the MyMoodle Page. The page was created by taking an XML feed from the college MIS system and rendered in PHP. Having just implemented student timetables and student attendance registers into Moodle I required space on the MyMoodle page for links to these two new pages. The most logical place for this was in a block and the “Logged in User” block was the perfect place to embed these links (and future links if required). In order to keep everything core I decided against hacking this block directly and instead cloned the block and hacked this one instead. I’ve cleaned it up and added some extra CSS elements and the final result is shown below. Now when I upgrade Moodle nothing gets overridden as this is now a separate block. I also have a block now with wich I can add extra functionality should the need arise.